Yet it is not this side of their activities - the active political side - which places the Quakers in a unique position. It is through silent assistance from the nameless to the nameless that they have worked to promote the fraternity between nations cited in the will of Alfred Nobel. …The Quakers have shown us that it is possible to translate into action what lies deep in the hearts of many: compassion for others and the desire to help them - that rich expression of the sympathy between all men, regardless of nationality or race, which, transformed into deeds, must form the basis for lasting peace. For this reason alone the Quakers deserve to receive the Nobel Peace Prize today. But they have given us something more: they have shown us the strength to be derived from faith in the victory of the spirit over force. And this brings to mind two verses from one of Arnulf Överland’s poems which helped so many of us during the war. I know of no better salute: “The unarmed only can draw on sources eternal. The spirit alone gives victory." This history comes largely from nobelpeaceprize.org. 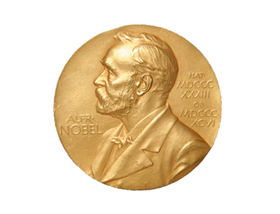 More statistics and facts about the Nobel Peace Prize can be found here.